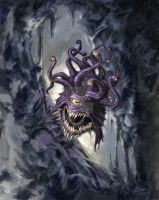 Cover image for Dungeon Magazine #141 of a fantasy creature called a Beholder. This one's blind in its primary eye. Paints by the talented Roberto Campus of Udon. Is a undead or just a mage? 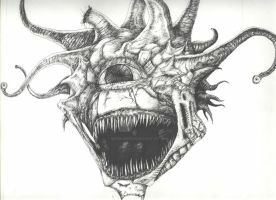 it's just wounded in its main eye in such a way that it is blind so it's not undead and a beholder is not a mage since most of its abilities stem from its eyes...though this begs the question: does a beholder with a blind main eye still have the ability to generate its anti-magic cone from said eye? But they can become mages if they do some weird ritual sacrificing their main eye as tribute. That's why my question though. Fantastic. Everything a beholder should be. Well, not blind. But it makes a great shot. you know what they say... beauty is in the eye of the beholder! Very good painting, the gums look good and shiny but I think some more drips of saliva would be good too. to much eyes, and blind...ho,ho!